Coming this summer in 2019, Rick’s eagerly awaited third album has been recorded and is in the mixing/mastering stages. Also recorded and due for release this summer is a collaborative album featuring pieces along with fellow artists Maggie Dodd and Michael Poole. In June, Rick will be a featured performer at the 2019 Mountain Laurel Autoharp Gathering. 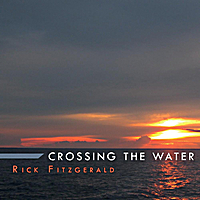 Rick Fitzgerald’s second album, “Crossing the Water,” has been released and is now available through CD Baby! Enjoy acoustical folk music that will tug at your heart and tickle your funny bone. Contemporary and traditional tunes, songs and ballads featuring the diatonic autoharp, voice and guitar. Rick Fitzgerald won the 19th annual Mountain Laurel Autoharp Championship in Newport, PA. The prestigious MLAG championship is held in conjunction with the Mountain Laurel Autoharp Gathering and is open to autoharp players from all around the world. Rick Fitzgerald was the first runner-up in the Coffee House Mid-Winter talent competition! A winner’s showcase concert will be held May 9th at 8pm at The Coffee House and will feature contest winner Chris Drobka, Rick Fitzgerald, and Cheryl Banks. The song, “Hooray for the Denis Sullivan,” was recently featured on the Simply Folk radio program. Thank you to those wonderful folks who called or wrote-in to Simply Folk with their requests! If you have a favorite song that you would like to hear on the program, head over to www.simplyfolk.org to make your request! 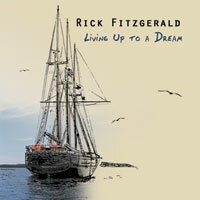 Rick Fitzgerald’s debut album, “Living Up to a Dream,” is now available through CD Baby! You can order online, hear clips of all the songs, and read reviews of the album. Of course, you can still order directly from Root River Music if you are so inclined. New show announced! Come see Rick Fitzgerald at Coffee House – West on Saturday, March 14th. Show starts at 7:30pm, arrive early for good seats! Rick Fitzgerald – “Living Up to a Dream” released! This long-awaited release features an inspiring collection of contemporary and traditional folk songs on guitar and autoharp.